While sometimes it can be impossible to prevent all potential accidents from occurring, the great majority can be kept at bay with our regular maintenance service. 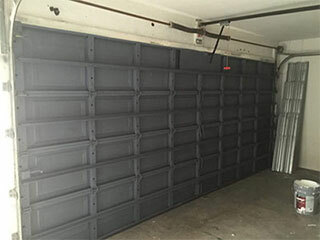 Our team specializes in preventing minor issues from developing into major problems, and ensuring that your garage door system is functioning smoothly and optimally. Your system's springs need a lot of attention, since their job is to be able to support the weight of your door panels. Our team can routinely adjust their tension to keep them from overstraining and also lubricate their coils to make sure they remain efficient and silent. The springs aren't the only parts of your garage door that need some regular lubrication. We'll also lubricate your hinges, to keep them from squeaking, and your rollers (as long as they aren't nylon coated) to make sure they don't get too worn and slide off. Your track doesn't need to be lubricated, but it does need to be examined for bends and the accumulation of debris. Count on us to straighten any dents on the spot and remove any potential blockages. In order to keep your door from closing down on someone, your electric opener uses a pair of safety sensors to detect when there's an obstacle that's blocking the door's path. If these photo-electric eyes become misaligned, however, it could lead to a major accident. During our service appointments, our technicians always test out the safety sensors and realign them to make sure their position is correct and that they are functioning properly. Routine maintenance can not only make sure that your overhead or roll up door is safe to use, it can also help you save money in the long term. Repair works are often much more expensive the more serious the problem is, so making sure the major issues are dealt with well in advance is both prudent and fiscally responsible. Call our experts at Garage Door Repair Portland today to schedule an appointment. Finding a good garage door service provider can be difficult. Finding a great one can be just about impossible. We'll, our professional team is glad to proclaim ourselves as the leading garage door repair company in the area. We make a conscious effort not only to perform every task we are assigned with speed and efficiency, but also to provide local homeowners with as much useful tips and advice as they want to hear. Feel free to check out our website.